Great breakfast, close to town centre. Didn't like noisy refrigerator. Which hotels are closest to the Gunnedah airport? Where to stay near top Gunnedah attractions? What kind of hotels are in Gunnedah? Which hotel chains are in Gunnedah? Visitors to Gunnedah are sure to enjoy the restaurants. Tourists can also enjoy the city's golf courses and parks. The picturesque setting of Waterways Wildlife Park and Kitchener Park exemplify the city's natural beauty. A couple of additional sights to add to your agenda are Gunnedah Golf Club and Gunnedah Visitor Centre. Gunnedah Lodge Motel - With a stay at this 4-star motel, guests can enjoy access to free parking and laundry facilities, along with free WiFi. Comfort Inn Harvest Lodge - Our customers like the breakfast and helpful staff at this motel. 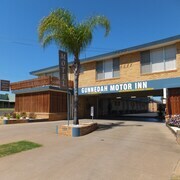 With a stay at this 3.5-star motel, guests can enjoy access to a restaurant and an outdoor pool, along with free WiFi. 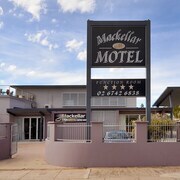 Mackellar Motel - This 4-star motel features free breakfast, a restaurant, and free WiFi. Expedia customers like its helpful staff and clean rooms. If you want to explore the larger area, hop on a train at Gunnedah Station. Gunnedah may not have many public transit choices so consider renting a car to explore the city. Gunnedah sits in the heart of the Liverpool Plains agricultural regions. At its centre, you’ll find a wealth of dining, entertainment, nightlife, and shopping. Picturesque landscape and plenty of local flavour give this region its unique flair. Pay homage to the poetry of Dorothea Mackellar with a visit to the bronze statue of her likeness in Anzac Park, or discover the Poet’s Drive plaques around town, emblazoned with her words. Locals and visitors alike share the joy of taking a tour along the Cycle Way. It’s a fantastic path to discover a favourite garden or park for picnics or photo ops. Country and farmer’s markets with local wares and flavours offer an extra air of individuality. When you’re done exploring town, the hotels in Gunnedah are ready with stacks of pillows to send you off to sleep. It’s common to find pubs, bistros, and beer gardens adjacent to Gunnedah hotels, which match small town charm with friendly hospitality. 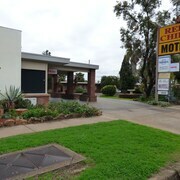 Clean and comfortable Gunnedah motels are easy to find and provide more affordable accommodation. Serviced apartments are a good options for longer stays and all the amenities of home. 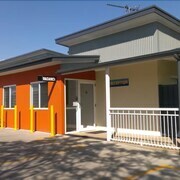 The nearest place to reach Gunnedah by air is Tamworth Regional Airport, which sees daily passenger flights from Sydney. Don’t rush off as soon as you land; spend some time in Tamworth, home of the Big Golden Guitar. Tamworth hotels are cosy and affordable, and there is much to see in town. Once you’ve explored the country music heritage, museums, and galleries, set your sights west. It’s an easy 45 minute drive to Gunnedah. Travel straight from Sydney on the TrainLink Xplorer train, a six hour journey. Once in town, it’s best to rent a car, as there is much to explore in the surrounding areas. A car is a must to travel the Kamilaroi Highway, which features must-see stops on the way into the Great Outback. While planning your journey, prepare for seasonal variety. Gunnedah sees hot summers and cool to mild winters with occasional extremes. It can be rainy in summer, so pack your umbrella. No matter how you start your Gunnedah holiday, or where it takes you, booking on Expedia.com.au ensures smooth sailing. Peruse Tamworth flights, compare accommodation, and get started on your perfect journey in New South Wales today. 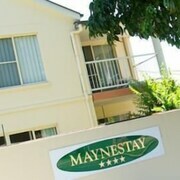 Are there hotels in cities near Gunnedah? 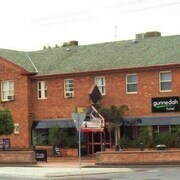 Explore Gunnedah with Expedia.com.au’s Travel Guides to find the best flights, cars, holiday packages and more!